So we’ve all been there right? You come up with an idea, want to share it with a stakeholder, whether it be a teammate, a boss, a VP or a CEO. Your idea is brilliant and could greatly benefit the company, but when you step in front of your audience, you freeze. You mumble, people are underwhelmed and your awesome idea never gets a chance to take root. Then you see a presentation another teammate gives to pitch a mediocre idea. Their presentation has flare. They’re engaging, they have graphs and charts and info graphics. They’re excited and it’s contagious. Their idea sails though approval. As an introvert, how do you move from pitch A to pitch B? 1. Start by getting in the zone, and remembering that what you have to say is important and that it could benefit not only you, but the whole company. 2. Before you even schedule time to discuss your concept, do the leg work. Do your research. Look at competitors. Get some cold hard data. Make some visuals. Fancy looking charts and graphs and info graphics can be made really quickly and easily with tools like Lucidchart. It doesn’t take a graphic design degree to figure out how to use it either. Use a template (they have tons) or click and drag to make your own. 3. Practice your pitch out loud. Pitch it to your significant other, or your kid or your dog. Find your stutter points and smooth them out. Integrate your visual elements and practice with those also. 4. Schedule your meeting and give the concept the level of excitement it deserves even while you’re just scheduling. 5. Walk in to that meeting with confidence knowing that you’re mega prepared and ready to rock your pitch. Make eye contact. Smile. Inject excitement. Toss out statistics. Do it up. 6. Sincerely listen to the feedback you receive, both positive and negative. Internalize it and use it to shape your next pitch. Don’t argue, don’t get offended, your audience is telling you exactly what they want/expect. It’s like a “how to get your next pitch approved” guide. 7. Afterward give yourself a pat on the back, take an Ativan, stop at the liquor store, take a nap or do whatever else it is that you do to recover from stressful situations. 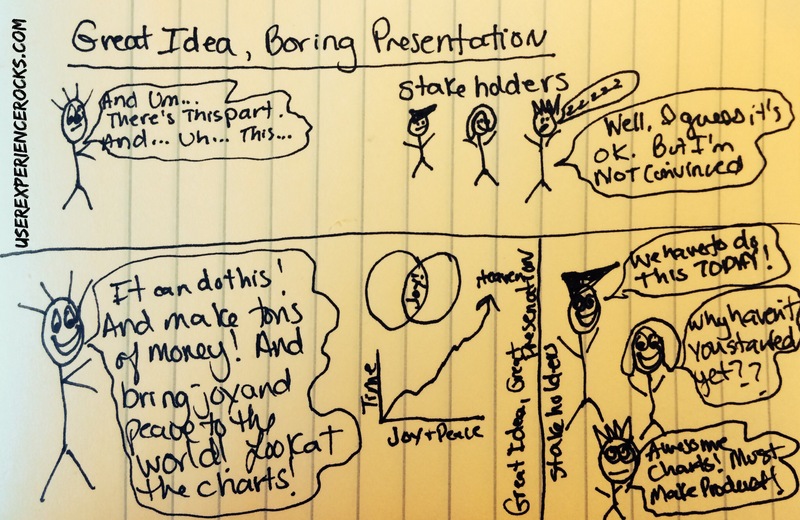 You owned that presentation and now it’s up to your stakeholders to take the reins.